My cat Sherbert is lost. He has been missing for several days. 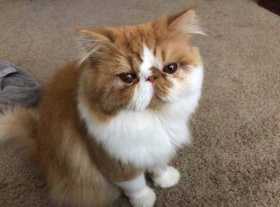 He is a mostly orange and white long haired exotic cat (Persian). He is only 2 years old and an indoor cat. He loves tuna, seafood temptations treats, face rubs, and cuddles. He is probably scared and hungry. Please if you see him call me and if you can, get him. I miss him.